Like reliving a long forgotten nightmare from biochemistry. Anesthesiologists have a surprisingly poor understanding of how anesthesia works. Maybe it's because we don't really understand how the brain itself functions or how consciousness is formed. All we doctors know is that the FDA approved these drugs for anesthesia. We inject them into a patient and, voila!, the patient is unconscious. Why is that? Sure we can recite some mumbo jumbo about GABA and NMDA receptors, but how do these cause the brain to fall asleep? It's remarkable that the FDA approved these drugs without more complete information on their mechanisms of action. 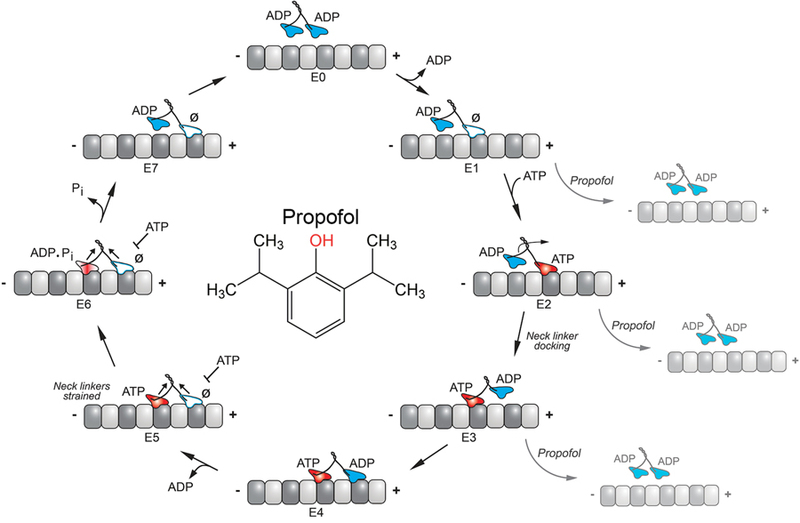 Now there is another explanation for how propofol and other induction agents work their magic. Published in the Proceedings of the National Academy of Sciences, researchers discovered that these drugs inhibited the movement of kinesins. What is that, you ask? In case you have completely forgotten your microbiology after twenty years of practice, kinesins are little intracellular motors that transport material along microtubules that allow the cells to function. 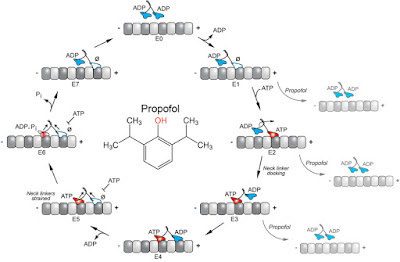 The researchers found that propofol, along with etomidate and ketamine, decreased the effectiveness of these kinesins to move their cargo. Though the rate of transport isn't affected, the distance the kinesins can move their cargo is decreased. Thus the neurons are not able to function normally and supposedly this will lead to unconsciousness. Or something like that. You'll have to go read the research paper yourself to get a more cogent summary of their work. I threw away my college microbiology textbook decades ago. I always wondered if anesthesia practitioners understood how the various agents administered interact. Seems like there are a huge number of possible combinations. Who Is Better At Assessing Surgical Risk?